Volunteer management in Causeview Volunteers begins at the level of a volunteer opportunity, which is a high-level volunteer project or volunteer need where volunteers can contribute their time to your organization. To begin managing volunteers in Causeview, begin by opening the CV Volunteers application. Select the Volunteer Opportunities tab, and then click on “New” to create a new volunteer opportunity. Complete as much information as possible about the opportunity and then save the new volunteer opportunity to Causeview Volunteers. 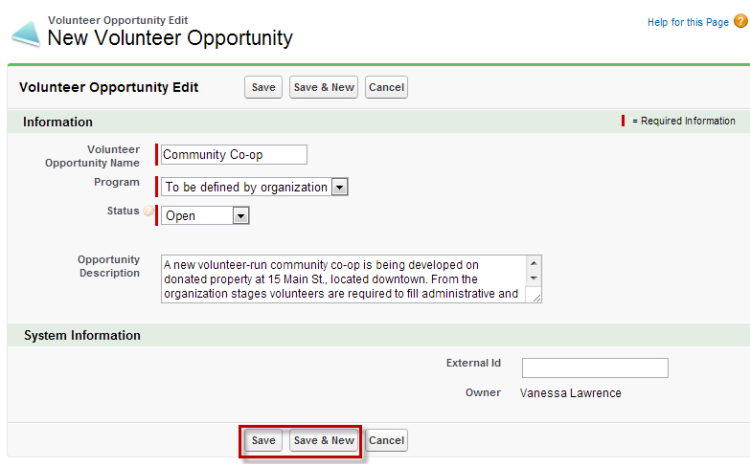 If you plan to create several volunteer opportunities at once you can use the Save & New button to open a new opportunity, but be sure to return to each opportunity to create volunteer roles and further define the opportunity. From the volunteer opportunity detail page, navigate to the volunteer roles related list and create a new volunteer role. Remember that the information saved for the role will appear on the volunteer portal, so it is important to complete as much information as possible. Begin with the “Information” section at the top of the page. The name of the volunteer opportunity where you created the role will already be filled in, but all of the required fields (marked with red bars) must be completed in order to save the volunteer role. Choose a descriptive name for the role and select the current status of the role from the drop-down menu. Select one or more locales where the role will take place by clicking on the locale name and using the right arrow to move into the “Chosen” box, or by double clicking on each locale. Set a Causeview user as the supervisor for the role. Once the required fields are completed, you can save the volunteer role. However, if you have more information about the role it is best practice to complete as much as possible. Select relevant languages using the same selection method as with locale, and choose the required or recommended education level from the drop-down menu. If shifts for the role will occur with a specific frequency select it from the drop down menu. 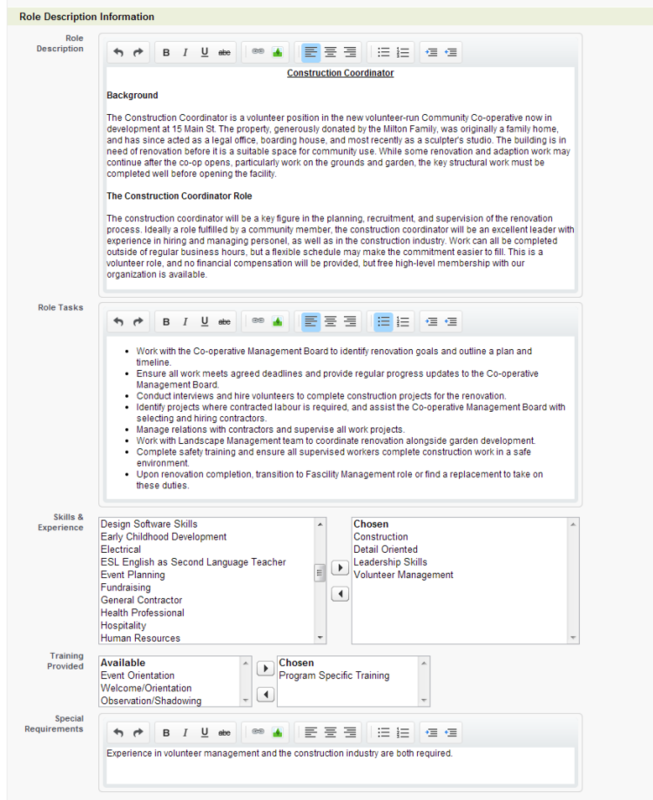 In this section it is also possible to select a role description template to populate the role description section. Use the look-up tool by clicking on the magnifying glass icon to display a list of role templates with an approved status. If a role template is chosen the description information from the template will override any information input through the role creation page. If you do not choose a role template for the role you can complete the role description information to provide volunteers with a detailed description of the volunteer role. The role description, role tasks, and special requirements all permit rich text, which means you can format your description information as you like to appeal to volunteers, including images and links to other web pages. Select the required or recommended skills and experience and the training provided to volunteers by double clicking on the words you would like to include, or by selecting them and then clicking on the right arrow. When you have filled in as much information as possible about the volunteer role you can save it, or save it and create a new volunteer role. If you choose to create a different volunteer role, remember to return to each role to add the known volunteer shifts. 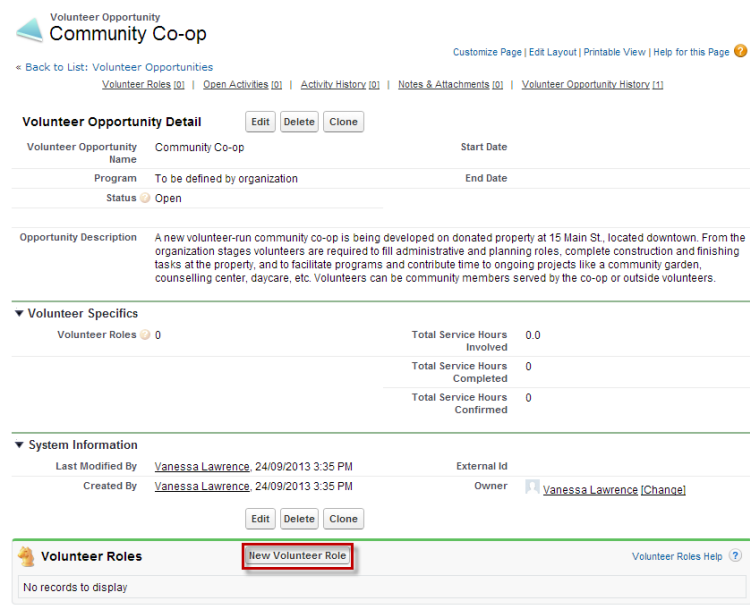 Volunteer shifts, which are displayed in a related list on the volunteer role, can be created from the volunteer role detail page.Shifts can be created, edited, or deleted using the “Manage Shifts” button found at the top of the detail page and above the volunteer shifts related list. The Manage Shifts button will open the “New Shift” interface, where volunteer shifts can be created or edited. Shifts can be created using different shift frequencies, which require different information. The most basic shift is a flexible shift, used when a volunteer will work hours on an unscheduled or very loosely scheduled basis. No set time for the shift is determined. If you would like to set the location of the volunteer shift, click on the magnifying glass to search through a list of organizations saved in Causeview, and select one by clicking on the account name. Create a flexible shift by clicking “Add Shift(s)”. A one-time shift occurs only once at a set date and time. In order to save the shift, a start date, start time, end date, and end time are all required. Once again you can set the location of the shift to a saved organization using the magnifying glass look-up. 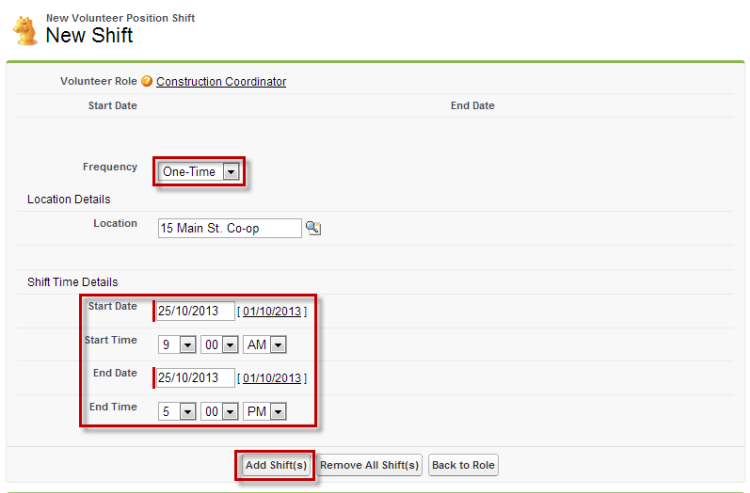 Once you have all of the details of your shift set up you can create the shift by clicking the “Add Shift(s)” button. Weekly, bi-weekly, and monthly shifts operate in a very similar fashion. Essentially each one creates a recurring one-time shift. Select the frequency for the shift to occur on, specify the total number of shifts, and enter the time details for the first shift in the series. For example, if a shift occurs on the first day of the month for six months, the “# of Months” should be set to 6, and the “Start Date” and “End Date” should be the first day of the month for the first shift where a volunteer is required. 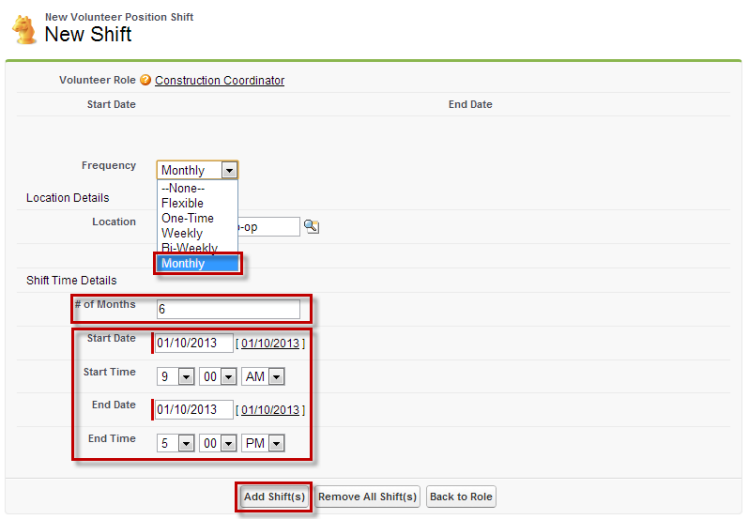 Once your recurring shift details are complete, create the shift by clicking the “Add Shift(s)” button. Created shifts will show up in a list below the shift creation interface. You may have only one shift, if the volunteer role is only needed at one time or if a single, flexible volunteer can complete the role, or you may have several shifts occurring at different frequencies. Note that the accumulated volunteer shifts will define the start and end dates for the volunteer role. In the case of a role with only flexible volunteer shifts, no start or end dates will be created. When all of the planned shifts associated with a volunteer role are are created you can return to the volunteer role detail page using the “Back to Role” button. Once the volunteer opportunity, volunteer roles, and volunteer shifts have all been created to the best of your current knowledge the creation process is complete. Your organization’s volunteers can now create applications for the volunteer roles through the volunteer portal, or you can enter volunteer application information for the roles in Causeview.